Access your server via browser in order to generate data (http://SERVER-IP/). Access the Kibana app via browser (http://SERVER-IP/elk/app/kibana), and use your user/password to pass the basic HTTP authentication. Specify a timestamp by entering this value to the “Available Fields -> @timestamp” field. Click the “Create” green button. On the left bar, click “Visualize” menu item. Select the “Vertical bar chart -> From a new search” menu options. 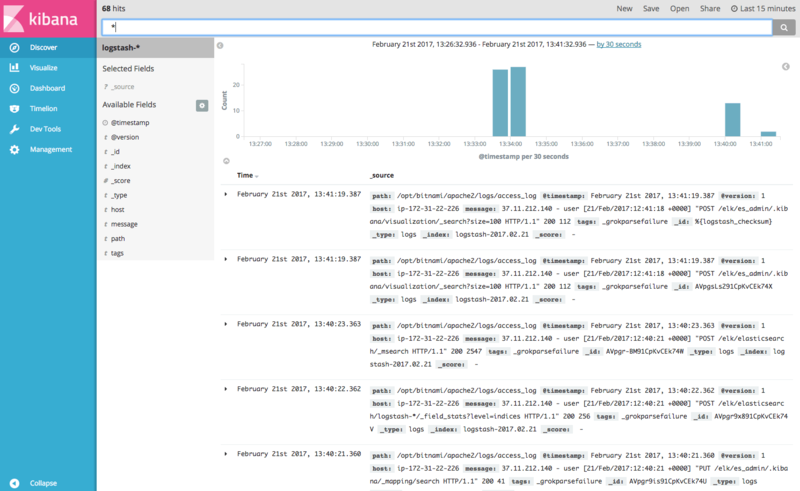 Click the “X-Axis -> Aggregation -> Date Histogram” button sequence. Select “Minute” in the “Interval” field, and click “Apply changes” button. On the left bar, click “Dashboard” menu item. Click the “Add” button, select the previous visualization and save the dashboard.